swissfreek 4 hours, 52 minutes ago. Only takes a few seconds, here’s a video, same firmware, different control board. If it gets stuck, it’s usually because the ADC FDBK isn’t setup or hooked up correctly. I got it to work. I made a bad solder joint on the servo when I attached the feedback wire and when I was zip tying the servo down I think that’s when it came off. I took the servo apart and resolderd it and put it back together. Ran the on ground tail tune and it worked. My number was lower than David’s. 82.6394. Thank you to jihlein, Kevin_Eric, and Fredoroo. I apologize for wasting yalls time, for something I should have caught. No worries, I’m just glad it’s working! I am working through a Tricopter setup with a KakuteF4V2 and a Spectrum satellite radio. I decided to move to the dronin software/firmware for the autotune/tailtune capabilities. Right now I do not get a response from the Spektrum radio. It was working in Betaflight on the R4 pad. 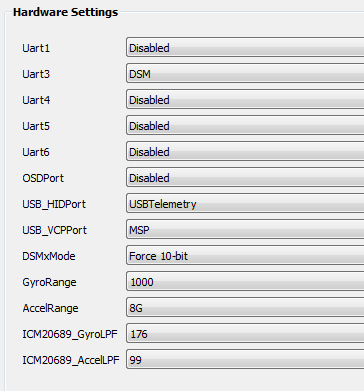 When I moved over the dronin configuration software, it would not let me select DSM for Uart4. So I soldered the signal wire to the R3 pad. Everything is set to DSM and I have tried to force 10-bit and 11-bit and I am not getting any signal. Any help would be appreciated. Is soldering to R3 the right change for this TriDronin setup? @vanbierstein – with the KakuteF4V2, we decided to use the UART4 RX pin for the 2nd servo feedback, which is used for the RCE bicopter. So UART3 RX is the correct pin. It seems I mucked up the DSM function when making the KakuteF4V2 port. There is a small software change I need to make. The good news is that change fixes DSM (I need to regression test to make sure SBus still works correctly), I have a satellite hooked up here on the bench to UART3 RX, and it’s now properly working. I have the port forced to 10 bit DSM. I don’t have the hardware to test 11 bit DSMX unfortunately. I’ve got some things I need to take care of right now, I will try to get new installer packages out later today. 2)Add initial BiFlight module. 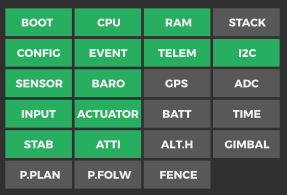 Allows servo positions to be recorded in telem. That’s all for now. This hasn’t been flown, but bench tested all new functions and regression tested Sbus function. If I understand well the video, the battery must be kept plugged until the drone is connected to a computer to save the new settings, correct? After the autotune completes, simply disarm the copter while still in the autotune mode. The necessary data will be saved in the flight controller. You can then unplug the battery. The next time the flight controller is plugged into the GCS, it will retrieve the data. There is an Android app for the GCS, but I don’t know how to build it, and it would need some modifications to understand the new triflight objects I added. Just tried the installer from post #60582 and the F3FC boot loops. @jihlein, any updates on functionality for the integrated f3fc? I’m interested in getting my V4 up and going on dRonin. So here are the new installers with a fix for the integrated F3Fc that works on my board, looking for feedback from others. Awesome! Unfortunately I won’t be able to test immediately because I’m away from my tri now, but I look forward to trying it when I get back. What’s that other thread? Is there any other info there that would be helpful? Thank you for all your work on this. @jihlein I installed the new dronin software and flashed the firmware and still is not working with DSM. I tried forcing the 10-bit and 11-bit, still doesn’t recognize the signal. The signal wire is soldered to the R3 pin. My radio is set to 22ms DSMX mode. I tried 11ms and DSM2 as well. 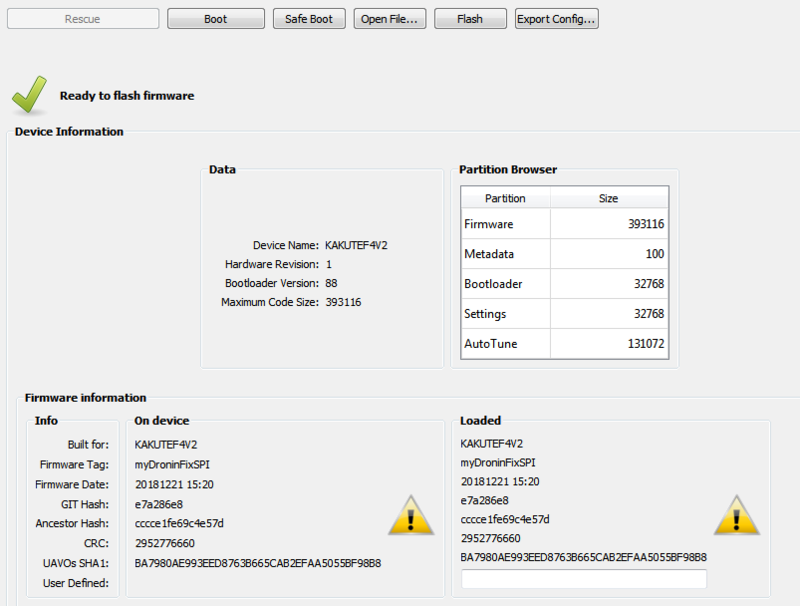 @vanbierstein – I just checked the firmware posted msg #60635 above on the KakuteF4V2 with DSM, and I have it working. Here’s some screen shots to help verify your setup. FWIW, I’m testing with a DSM module in my Taranis+, bound as 10 bit DSM to a DSMX satellite. My DSM module does not support 11 bit DSM so I can’t test that. Part of the confusion is my fault, I’m trying to fix a number of small issues and have not merged everything to a stable base line yet. I’ve got one more set of changes to complete, and then if we can verify that the DSM, SPI all work, I’ll get that stable build with all changes built. Once that is built, I think we need to find a good spot in the forum to post the latest and greatest, rather than in the middle of these forum posts.